Many software applications use DDE communication in Windows OS's. For instance, office applications, LabView, Simulink, Windows Shell have built-in DDE functionality. Many devices and systems as PLC's, fire alarm systems, I/O modules have device communication drivers implemented as DDE servers as well. Applications can use DDE for one-time data transfers and for ongoing data exchanges. 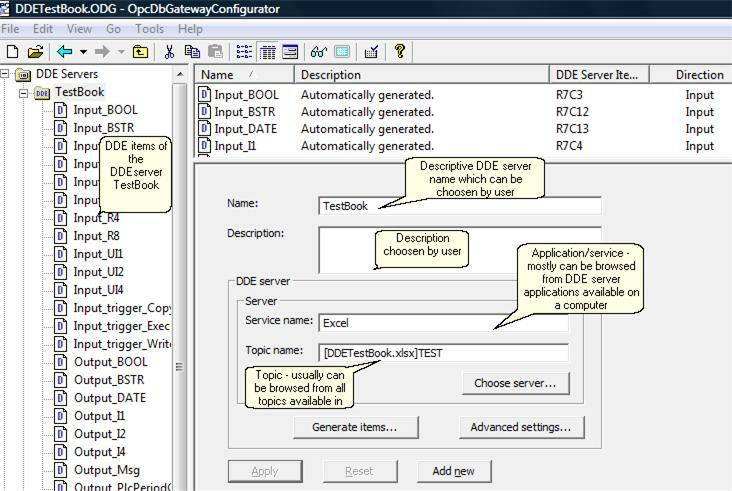 DDE client driver for OpcDbGateway and SAEAUT UNIVERSAL OPC Server enables integration of DDE items to software applications for collecting processing and visualizing data. It consists of two parts - the runtime and the configuring one. The configuring part enables to configure applications although with enormous amount of DDE items easily and fast. It is provided by using of DDE servers discovery, DDE items browsing, index ranges defining, choosing of cell ranges in MS Excel by mouse. Preconfigured function blocks enable using of full DDE functionality in complex configured applications. The DDE Client Driver is capable to communicate with any server that supports the "CF TEXT" DDE data format. Addressing uses familiar "Application Name| TopicName ! ItemName" method for DDE server data. It can be used to connect with one or more DDE servers. The driver will automatically reconnect when DDE servers stopped and then brought back on-line. - all major data types are supported.